In the South, it can be challenging to navigate the hassles of lawn care in an unpredictable climate, particularly when hot weather can begin early in the spring and last well past the beginning of fall. We encourage all of our customers to consider the amount of water it takes to protect your lawns and gardens from hot temperatures and drought conditions. Did you know that every inch of standing water that collects on an acre of land can equal more than 27,000 gallons? According to Clemson Cooperative Extension, most turf grasses need about half an inch of water in coarse, sandy soil and one inch of water in heavy or fine-textured soil. These amounts will moisten the soil to a depth of four to six inches. However, if you cannot apply this entire amount at once because of water running off from the lawn, apply about half an inch at a time and allow the water to soak in before you continue. In general, bermuda grass needs a total weekly application of about 1 to 1 ¼ inches of water. Sandy soils often require more frequent watering, for example, ¾-inch of water every third or fourth day. For more information on watering lawns refer to Clemson Extension. Once you water, do not water again until you observe water deficiency symptoms. Never water the grass every day except during the establishment of newly seeded, sodded or sprigged lawns. Watering every day with a small amount will encourage a shallow root system, making the grass less drought tolerant. Try to stretch the interval between waterings to as many days as possible to encourage the development of deep, extensive roots. Once you choose to water, continue watering. Encouraging the lawn to break dormancy and then not watering again will exhaust the plants and can cause injury. Water early in the morning; it is the most efficient and beneficial time. Water evaporation is minimized so that a high proportion of the applied water is used by the grass plants. Also, early morning irrigation may curtail the development and spread of diseases. Use your irrigation system wisely. For an in-ground, automatic sprinkler system, set the time clock to "off" and manually turn the system "on" when the lawn needs water. The automatic position on the time clock is useful when you are away for more than a few days. Even then, the clock can be made to operate more efficiently by installing a rain shut-off device that overrides the system when it rains. For more information, visit Clemson Extension. How much water does your lawn need? Most lawns need one-half to one inch per acre. For an easy method to determine how long that is for most lawns, visit Clemson Extension. 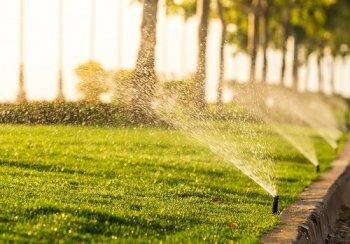 Do you irrigate your lawn? You can save sewer charges on water used for outdoor uses like lawn and garden watering, and pools by installing an irrigation meter. Customers may contact our New Connections Department for current fees associated with this installation. For more information, go to https://www.spartanburgwater.org/manage-water-service. Many homeowners irrigate for a given number of minutes without knowing how much water they are really applying. Save water and money by learning how to calibrate automatic sprinklers. Go to http://www.clemson.edu/extension/hgic/plants/landscape/lawns/hgic1207.html. You don’t have to water the entire lawn. Consider watering only those areas that need water. To look for “signs of thirst” go to http://www.clemson.edu/extension/hgic/plants/landscape/lawns/hgic1207.html. Micro–irrigation or drip systems are generally more efficient than conventional sprinklers, because they deliver low volumes of water directly to plants' roots, minimizing losses to wind, runoff, evaporation, or overspray. For more information, go to https://www3.epa.gov/watersense/outdoor/tech.html. Drip irrigation systems use 20-50 percent less water than conventional pop-up sprinkler systems and can save up to 30,000 gallons per year. Consider installing drip around trees, shrubs, and gardens in place of a conventional sprinkler system. For more information, go to https://www3.epa.gov/watersense/outdoor/tech.html. Rainfall shutoff devices turn off your system in rainy weather and help compensate for natural rainfall. This inexpensive device can be retrofitted to almost any system. For more information, go to https://www3.epa.gov/watersense/outdoor/tech.html. Set four identical cans at various distances from the sprinklers within the spray pattern of the sprinkler zone. Write down the location of each can and turn on the sprinkler zone for 15 minutes. After 15 minutes, turn off the zone and measure the water level in each can with a ruler. Write down the amount of water inside each can. Differences in the amount of water in each can will tell you what areas within each zone need more or less water. Move or adjust the sprinkler nozzle to make each zone more efficient. Pour all the water into one can, which equals the amount of water your sprinkler system delivers in one hour. Sewer charges are normally based on water usage. Spartanburg Water uses seasonal averaging to adjust sewer charges for spring and summer residential water use that is not returned to the sewer, such as lawn and garden watering, car washing, and filling pools. Spartanburg Water uses the customer’s average winter billed water consumption to adjust the sewer charge. An irrigation meter is a separate tap and meter connection that is installed to supply water for outdoor purposes, including lawn irrigation, swimming pools, gardening or greenhouses, and they may provide a cost benefit for customers connected to the public sewer system who use water for outdoor purposes. Because the water measured by the irrigation meter does not flow into the sewer system for treatment as wastewater, there are no sewer charges, requiring the customer to pay for only the water and the base charge for services. Irrigation meters may be subject to additional regulatory requirements for backflow prevention and annual testing. The costs for testing vary and are the sole responsibility of the customer. 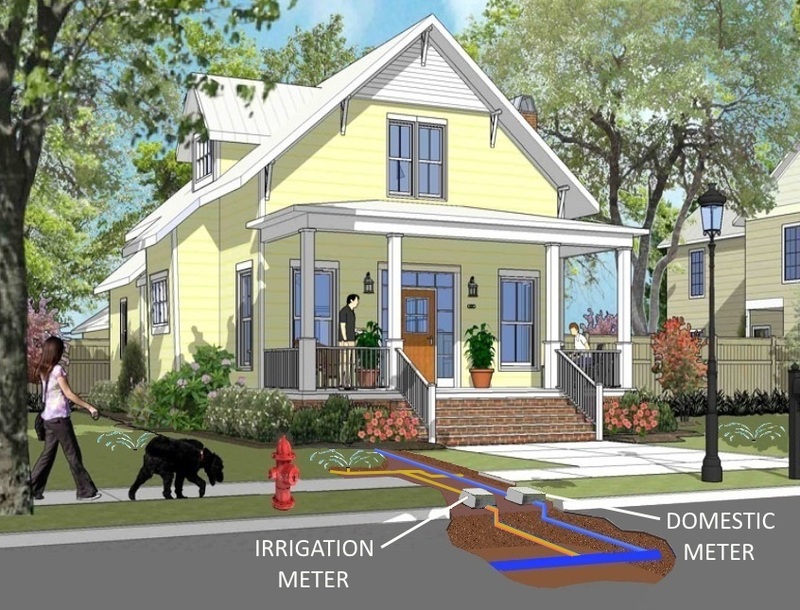 The customer is responsible for installing and maintaining the line that connects the irrigation system or other plumbing system to the meter, but Spartanburg Water maintains responsibility for the installation and maintenance of the tap, meter and line from the water main to the meter site. There is a one-time cost for the meter and its installation by Spartanburg Water of $750. For more information about installing an irrigation meter, call our New Connections Team at (864) 583-7361, or visit our Main Office at 200 Commerce Street in downtown Spartanburg. For more information on irrigation meters, click here.